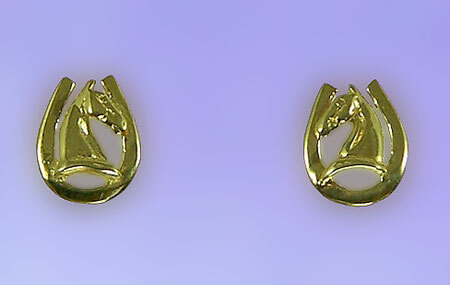 "Horse Head on Horseshoe Earrings"
Small horse heads on a horseshoe. The Gorgeous Horse your source for awesome equestrian jewelry. Small yet refined offering exceptional detail, would make this pair great for the horse lover. Designed for everyday wear and tear. Dimensions: 1/4 inch wide x 3/8 inches tall. Available in 14 kt yellow or white gold or sterling silver. Have our jewelers cast these in a two-toned design. Simply request would you would like to have done by using our comments box below.